Welch was really steady at the point for the Gophers against Penn State. But, can he continue the solid play against Diet Wisconsin?? Well, the Gophers get a chance to continue their winning ways against a slow, unathletic Nebraska squad. Think of them as Diet Wisconsin. Nebraska will use 32 of the available 35 seconds on the shot clock. They will be lucky if they have one dunk all night. And yet, they still might find a way to stay in this thing. Hopefully not. As always, these are actual tweets from during the game. Amelia!! Good to have you back in the tweet bag. I am not sure what I think about Tubby’s new line-up. I know they dominated Penn State. But, it was Penn State. I know they beat Michigan. Though, in all fairness, Big Blue was probably looking past the mighty Nitanny Lions to their border rival: Michigan State. @apearson #gophers no longer dead to me. For heavens sake don’t blow it at Nebraska. I am not entirely sure what this means, but both teams look like Englishmen playing basketball. Very slow pace (even for a Big 10 game). We are on pace for just south of a 47 to 43 game. Not sure that style fits the Gophers game. They always do better when they are running and pushing the tempo. To provide a little insight to this comment, Nebraska has a…guy…Andre Almeida, who looks like he could eat Mbakwe (whole) playing center. No joke, this guy looks like he could be Honey Boo Boo’s older brother. Amazingly though, he has incredibly quick feet and soft hands. He is sort of the anti-Mo Walker. Or, because he is Brazillian — and let’s face it, Brazillians are smooth — he might just be the Brazillian Mo Walker. @FromTheBarn – Defense by the #gophers is pretty pathetic tonight. Why limit it to the defense Jonathan? The offense is not exactly lighting the world on fire. Currently 17 of the 19 points are from Mbakwe, Ingram, and E Squared. That does not paint a rosy picture for the second half. Also, our projected final score is decreasing by the minute. The one bright spot (and I swear this is not a jinx): Julian Welch. He has actually looked pretty comfortable as the PG. He is making good decisions and forcing the ball down low. Literally seconds after I write this, he bricks two FTs. Never mind. I think you are getting warmer Jonathan. Yikes. Gophers look absolutely amateur on offense and defense. About the only thing keeping them in this game, Nebraska’s inability to hit WIDE OPEN jumpers. Cannot continue to rely on that. @DailyintheBarn – Eliason, who averages 2 points per game, leads the #Gophers with 7. Minn. down 23-21 w/ 43 seconds before half. If not for E Squared, who is playing well in his homecoming, the Gophers would be in BIG trouble. Eliason has hit open 15 footers and been a presence inside. He is on quite a run now and looks to be a promising player for next year’s squad, IF, and that was intentionally a big if, he can continue to get stronger. Perhaps next year’s team will not be a complete step backwards. The Gophers looked pretty lifeless in the first half. This was definitely not the team that beat the number one team in the country. This looks a lot more like the team that lost 8 of 10 going into that Indiana game. If the tempo does not pick up, the energy does not get cranked to 11, then there is a good chance the Gophers squander away the capital they have added to their resume the last two games. They need to get back to what they do best: pound the ball inside, crash the offensive glass, and play solid man-to-man defense. 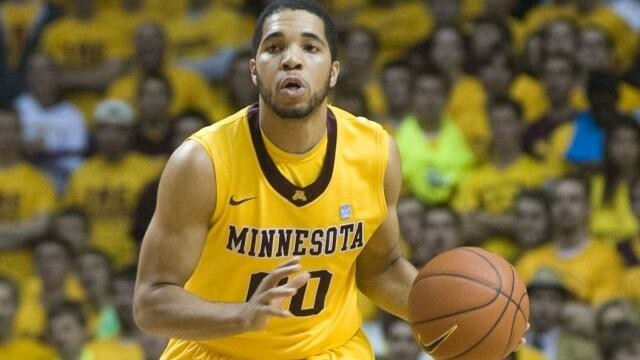 @Border_Rivals – Most telling statistic: Gophers average 8.1 steals a game. In today’s tilt: 0. Yikes. #Gophers #ActiveHandsTimes?? Okay, I had to help out a bit. But seriously?!?! Zero steals??? Brutal. The bigs are playing well. Mbakwe, Ingram, and E Squared looking good. Need the Hollins Cousins to step up and play like they have all season. Right now, completely absent from this game. Whoa, whoa, whoa, let’s slow down a bit Jon. Maybe we teach them what a screen is AND THEN we ask them to set one. The offense is beyond stagnant and stale, it is entering the rigomortis phase. Just not good. If it were not for the impromptu block party, the Gophers would be down 15+ right now. @Amelia Rayno – In his time of need, Tubby has gone back to his original starting five. But #Gophers playing under pressure now. Amelia!! Don’t jinx them!?! It is bad enough the Gophers are having a hard time figure out how to go about getting the ball through the orange rim, let’s not add to the pressure. Need to make a mini-run in the next 4 minutes. Something in the range of 8-0 or 12-2. Make it close with 6 to 8 minutes left. They should be able to escape with the win if they can do that. I used to love that song. Gophers need two offensive rebounds off missed FTs to score 2 points. I am not belieeeeeeeving. @knategiesen – Take over the game Mbakwe! We need you to win this for us! Could not agree more Knate. Mbakwe grabs ANOTHER offensive rebound off a missed FT and slams home the dunk. Hopefully he has another solid 10 plus minutes left in him tonight. You know you are in trouble when the Husker fans are starting to believe. Or…excuse me…beliiiiiiiiieve. Gophers in the double bonus the rest of the way. Normally, you would say get to the rim so you can get to the stripe. Something tells me John and his fellow Husker fans would be all for that strategy. Trevor did all he could against the 300 pound behemoth. Unfortunately, his guards do not understand how to get him the ball. Not. Good. Right on cue, Maverick snags an offensive board off a Hollins air ball and puts in the reverse. Then, after a slow rotation let’s the mini-Cody Zeller, Ubel, exact a little revenge, Dre goes into cold-blooded mode and cans an open 3. @goldengopher – Dre Hollins is fouled on the rebound. David Rivers…HE GONE! 2nd player to foul out. #Gophers on the line to tie. The refs are really bailing out the Gophers. Unfortunately, the Corn Huskers daywalker uses a HUGE screen from Andre Boo Boo to create a three point play. Gophers still down with less than two minutes to go. Have to love the confidence in the coach. Though, turns out to be very prophetic. Gophers end up with a forced shot from Dre (that nearly goes in), though it had nothing to do with Tubby’s play design. At least, I hope it didn’t considering the result. Somehow, Nebraska gives the Gophers (and Tubby) another chance to scheme a play to tie. The Huskers turned the ball over on the in bounds. However, the iPad-less Tubby comes through again and the Gophers get a 25 footer from Maverick Ahanmisi with 6 seconds left in the game. Not that giving the ball to Hollins (our SG) would have been a better idea considering he had 0 points on the evening. Overall, another frustrating loss for the Gophers. Even though their ticket to the tournament was stamped a week ago, this loss assures them of a low seed, probably something in the 8 to 11 range. And, if they lose this weekend against a game Purdue squad or in the first round of the Big 10 tournament, it could be much worse. At this point, I want to beliiiiiiiiiieve, but I am not sure I have the patience. This entry was posted in Badgers v. Gophers, Home and tagged Amelia Rayno, Andre Ingram, Austin Hollins, Corn Huskers, Diet Wisconsin, Dre Hollins, E Squared, Elliot Eliason, Golden Gophers, Joe Coleman, Joe Colemand, Julian Welch, Mbakwe, Michigan, Minnesota Golden Gophers, Nebraska Corn Huskers, Penn State, Trevor Mbakwe, Tubby Smith. Bookmark the permalink.